Mother’s Day…at the first mention in the week leading up to Mother’s Day my conscious mind didn’t take much notice except for one fleeting thought, Oh it’s that time of year again? Too busy to give Mother’s Day much notice, somewhere cloaked from my awareness, a subliminal spark ripped raw the entombed emotional sorrow of my son’s death. Thoughts emerged from deep yearnings, I want my son. I want my son back. In the five years since Kristoffer was killed in action (October 22, 2011), I’ve regained enough emotional equilibrium and emotional margin to resume the passion that fuels my purpose. No longer feeling my identity, my life, and my purpose extinguished, I’ve embraced my new normal and re-boarded the runaway train characterizing my daily life. Even so, mourning’s vexatious vibes never fail to seize hostage my emotions, once again reenergizing the demons of heartbreak on celebratory days that once brought wonder and joy. 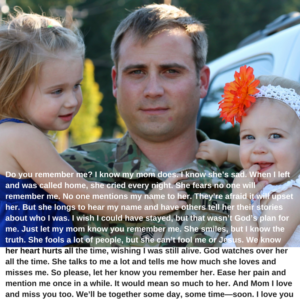 As I struggled with the approach of Mother’s Day this last week—from the Top 5 Things to Buy Your Mom to yearning for hugs this side of heaven—the announcement of another SEAL killed in Iraq sucker punched my emotional gut. When they announced the SEAL’s age, 31-years-old, I thought, Two years older than Kristoffer when he was killed. Every time another parent’s child is killed in action in a war that some claim is somehow not war, their death bayonets an instantaneous spike into the hearts of Gold Star Families seared with “the knowing.” The shock. The anguish. The shattered hearts. The torment of worrying about their buddies struggling with their child’s death. The misunderstood mourning of those propelled by ‘the news’ into the most complicated, unwanted journey of a parent’s life. The bond, the blood of the Gold Star sisterhood began posting the death of that SEAL on Facebook, and many of us began praying for Special Warfare Operator (SEAL) 1st Class Charlie Keating IV’s family. What a cold, calculated calloused statement to utter to the media from within a politically detached bubble when a new Gold Star Mom and family reel from the FACT their courageous son WAS killed by ISIS, who I prefer to call Daesh, which means “to trample, to crush underfoot, one who sows discord.” To politicize and parse a definition “not on a combat mission” that spilled the life blood of someone who served honorably is beyond cold-blooded. While it may serve some political purposes, it felt dishonoring, disqualifying the ultimate sacrifice of Keating’s service and sacrifice. It felt disrespectful because Gold Star families live with the daily agony of the loss of our dead children—you don’t. Deadlines last week electrified me, keeping me afloat and focused. After feeling ill about Keating’s fiancé, my heart smiled when I read Keating secretly married her. That gave me a much-needed lift. On Thursday, I sat alongside other Gold Star mom’s, who understand my struggles, in the General’s home on Fort Carson. On Saturday, I received an unexpected Mother’s Day boost—being in the presence of Army Rangers, some who knew my son. 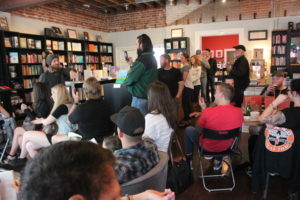 I attended Leo Jenkin’s book launch book for his book First Train Out of Denver published by Blackside Publishing. A much-needed Mother’s Day laugh emanates from looking at Leo’s thoughtful gift, two beautiful pens crafted by fallen hero SSG Chris Falkel’s father. 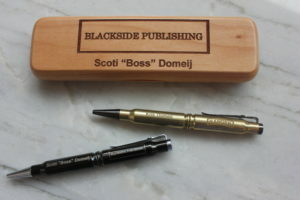 One pen is inscribed with the Ranger logo and the other pen and the box are inscribed: “Blackside Publishing, Scoti “Boss” Domeij.” Leo’s life and heart and journey and hard-won growth is ever a humbling reminder to me of the issues and struggles of the amazing, courageous military community who embraced this Gold Star mom. Just as the first verse of our National Anthem begins with this question, Oh say can you see?, how do I see my way through Mother’s Day when a part of myself—my firstborn—is missing in Mother’s Day action, gone until we meet again in God’s presence? I honor my son’s service by remembering his place in history. 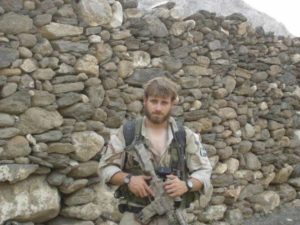 Kristoffer volunteered to defend, protect, and preserve for his children the same liberty paid for by other fallen heroes and veterans ahead of him who also defended, protected and preserved liberty for him, for you and your family, and for me. I remember my prayers that God answered, to give Kristoffer a wonderful wife. My daughter-in-love is the best mom a grandmother could ever wish for. I savor my time with Kristoffer’s younger and only brother. I choose to remember over 50,000 of our sons and daughters who returned home forever changed and visibly scarred—burned, disfigured or limbless—or invisibly wounded, struggling with traumatic brain injuries or post traumatic stress. And I choose to remember the sacrifice of all: wounded warriors and their families and the families and wives and children of those who currently serve our country. The Tragedy Assistance Program for Survivors (TAPS) offers compassionate care to all those grieving the death of a loved one who served in our Armed Forces. Since 1994, TAPS has provided comfort and hope 24 hours a day, seven days a week through a national peer support network and connection to grief resources, all at no cost to surviving families and loved ones. TAPS has assisted over 50,000 surviving family members, casualty officers, and caregivers. TAPS serves ALL survivors: adult children, children, ex-spouses, extended family, friends and battle buddies, grandparents, parents, siblings, widows/widowers/widowed and significant others through survivor grief seminars, suicide survivor grief seminars, retreats, expeditions, ‘inner warrior’ events and an online community. 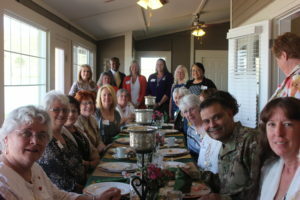 The TAPS Military and Veteran Caregiver Network provides pre- and post-9/11 era military and veteran caregivers with peer support and partners to reduce their isolation and increase their sense of connectedness, engagement, hopefulness, wellness and their knowledge and skills. 800 Phone Number: If you just need someone to talk to, please call TAPS any time at 1.800.959.TAPS (8277). The TAPS survivor care team can also tell you about services and programs you might find helpful. The TAPS resource and information helpline is available 24 hours a day, 7 days a week, 365 days a year.